Newbold & Collins has earned the reputation of being Australasia's premier hand-binding workshop. With a sound knowledge of book construction and repair procedures, archival principles and presentation possibilities, we are able to perform the tasks required to build and maintain a prestigious library. A full paper conservation service, equipped to rectify the degradation of works on paper. A portfolio and album manufacturing division catering to the exacting requirements of professional photographers and creative people wanting to display their work in a custom-made, prestige format. The ability to produce special 'one off' commissions. We are very proud to be associated with the flourishing Australian film industry and have made props for several productions. Babe - a cloth covered book used by Farmer Hoggett titled 'The Rules of Sheepdog Trials'. Matrix - a hollow book used by Keanu Reeves to secrete computer software. Mission Impossible II - First Class in-flight menus used by Tom Cruise. Sydney...story of a city - a replica of a 1930's United Kingdom passport, made accurately enough to be filmed close up and shown on the IMAX screen. Not all the work entrusted to us has great monetary value, or is destined for Hollywood. 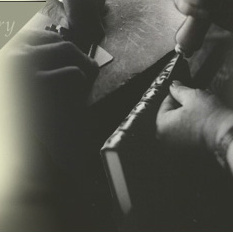 We repair books of a purely sentimental value, bind Theses, periodicals, journals and personal documents. We have replaced the leather lining in a rare Tea Caddy, re-leathered and tooled writing desks and bureaus,and even made a hollow, leather covered book to conceal a cake from 200 unsuspecting wedding guests. We would be happy to discuss your special project.